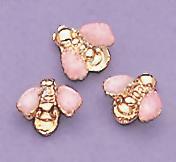 Baby Bee Tacks, gold setting with pink enamel wings. Price is per package, 12 to a package. Made in the USA. Please see our other baby bees gold TA91, silver TA91S, TA91R and slightly larger bee TA21.